Tagu8go: nokemes wajoimizik stands strong with her family above the river. Autumn, grandmother beech waits for the change. A small but mighty member of the plant nations stands tall at Wantastegok in the early autumn. It is good, strong medicine – wlinebizon. Elie Joubert tells us: The Abenak call it “Akwi odam8w8gan nebizon” = Stop smoking medicine. Lobelia inflata is made from Indian Tobacco and is great to relieve nicotine urges. It is a homeopathic medicine. A late appearance by a good friend. Roxanne Dunbar-Ortiz’s public talk focuses on North America in the context of US settler-colonialism. 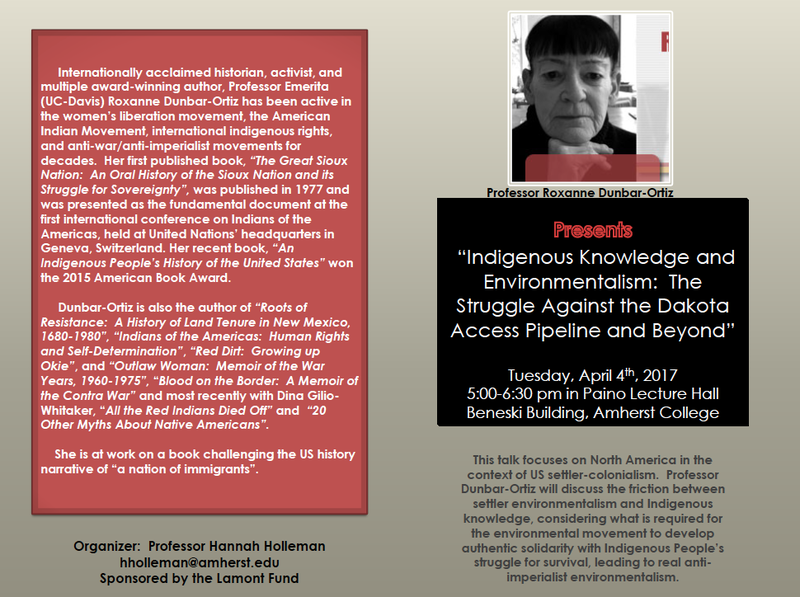 Professor Dunbar-Ortiz will discuss the friction between settler environmentalism and Indigenous knowledge, considering what is required for the environmental movement to develop authentic solidarity with Indigenous Peoples’ struggle for survival, leading to real anti-imperialist environmentalism. Link to file for the Dunbar-Ortiz Poster. Whether we like it or not, Saglutupiaġataq (“the compulsive liar” in Iñupiatun) is now president of the United States and Republicans control Congress. Federally recognized Alaska Native and American Indian tribes should brace for the worst, including the possibility that Congress may move to terminate federally recognized tribes. The termination era of 1953 to 1968 involved Congress stripping tribes of their lands and criminal jurisdiction. The policy was thinly disguised as an attempt to lift American Indians and Alaska Natives out of poverty by assimilating them into mainstream society. However the real goal was to privatize and ransack American Indian and Alaska Native lands. Trevien Stanger on learning within the place that finds you. Cultivate the relationship.